The pole banner annouces their body shop! Excellent customer service is a hallmark of the client experience with Superior Signs and Graphics. It sets us apart from the competition and is a great asset to our patrons. Consider the service manager of Delillo Chevrolet in Huntington Beach. A sizable car dealership with an excellent parts department, he wanted a new pole banner to let passersby know about the dealership’s first-rate body shop. At first, he contacted another sign maker. After three phone calls that never resulted in a return call, he contacted us. We designed, produced and installed a double-sided pole banner within just a few days. Even after we had climbed down the ladder, cleaned up our supplies and left the job site, the service manager still had not heard back from the other company. No wonder he was happy with our customer service! 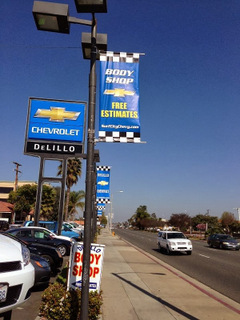 It should not take a couple of weeks to order dealership double-sided pole banners. Orange County, CA, has a vibrant business community that needs its vendors to be onboard with outstanding customer service so that its members can – in turn – serve their clients and customers. We understand that speed is of the essence when you need a new sign. After all, signs are part of your overall marketing package and a failure to advertise today is another day that potential client relationships are missed. 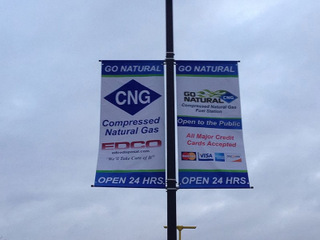 Double-sided pole banners attract attention! We are a full service sign company that takes customer service seriously. We believe that excellent customer service and stellar products are two sides of the same coin. It is impossible to offer one without the other. We work with clients who already have blueprints of their desired signage in hand. We also work with those who come to us without so much as a rudimentary idea but only the knowledge that they need some type of signage product to accomplish a desired goal. In short, we counsel, we sketch, we design, we manufacture and we install. We produce a wide variety of banners for retailers, service providers and non-profit organizations. Whether you need pole banners like DeLillo to advertise a new department, product or special occasion, or you need temporary signage for your storefront to advertise a seasonal sale, we can provide you with the right markers. Our banners are suitable for indoor use, trade shows, exterior walls and for hanging on construction site fencing. Our exterior banners are made from heavy-duty materials that easily withstand heavy downpours as well as long-term sun exposure. Hang them from poles, attach them to stands or use grommets and pole pockets for securing this signage. Banners can be seen by foot and vehicle traffic! What should you say on your banner? When you work with out experienced graphic artists, we can help you with the message as well as the layout. Decide if you want to add graphics, rely simply on lettering or combine the two for best results. Our technicians come to your location, gauge the street traffic that you get and then suggest a banner size, setup and the use of graphics that is in keeping with making the marker the easiest to read for motorists as well as pedestrians. Contact us today for a free quote and a quick turnaround!